What can you make from Hvar’s natural resources? Following coffee at Cafe Splendid in Jelsa one morning, on the way back to the car we happened upon a sign for an arts and crafts fair. This had been part of the May Fair celebrations which had been held when we weren’t able to go, so we were delighted to find it had been repeated. 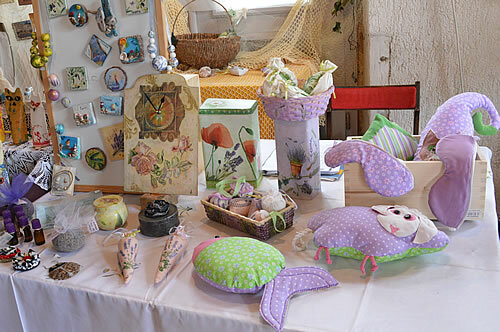 This lovely event was a showcase of Hvar’s natural resources, and the various creative ways in which local artisans use them in their products. 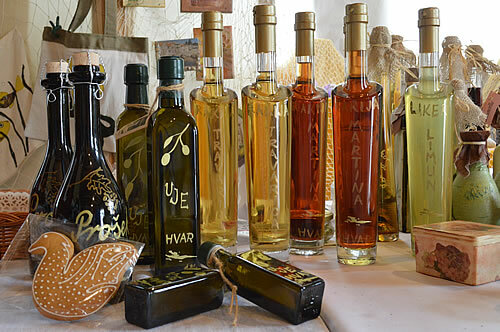 There’s a Total-Hvar article on Eco-Hvar: Jelsa’s May Fair with more pictures and a great description by Vivian. Starting with the alcohol (and why not? ), we had a chance to taste some of the liqueurs on offer – my favourite was the mandarin (needs no translation! ), which I liked a lot. 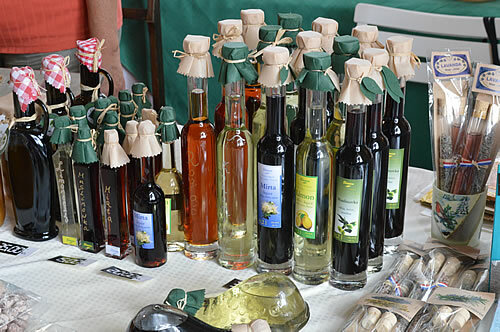 Other variations included višnje (cherry), mirta (myrtle), rogač (carob), koromač (fennel), and limun (lemon) – all made from home-grown produce. 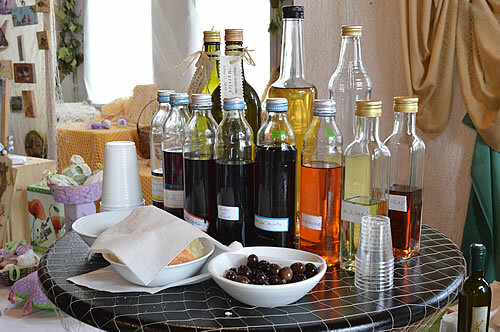 There was also a rather good prošek, travarica (herbal digestif) and a selection of wines laid out for tasting. Next came the oils, the olives, jars of conserves, dried figs and sugared almonds, which, be warned, are VERY addictive. Lavender, naturally, appears in many products, from bottles of lavender oil, soaps, herbal teas, dried flowers, embroidered sachets for your drawers, etc, etc. It’s the quintessential perfume of this island, and has some wonderfully beneficial qualities. Likewise rosemary appears in many products, not to mention so many other aromatic herbs that grow here. 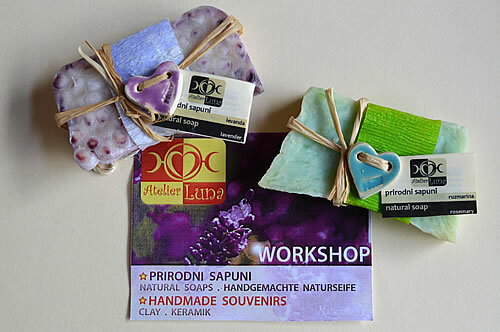 We bought some of the lovely handmade soaps from Atelier Luna, which looked really pretty and smelled heavenly – the soap, that is, not the artist! Atelier Luna, we learned, used to be in Vrboska, but is now based in Jelsa. The little ceramic hearts and the careful packaging on the soaps makes them a wonderful souvenir of the island. It’s such a pity there isn’t a scratch and sniff media option for the blog, you’ll need to imagine the drifting scent of lavender and rosemary for yourself! There were some beautiful works of art and handcrafts of all kinds on display, from paintings and photography, to textiles, jewellery and sculptures. 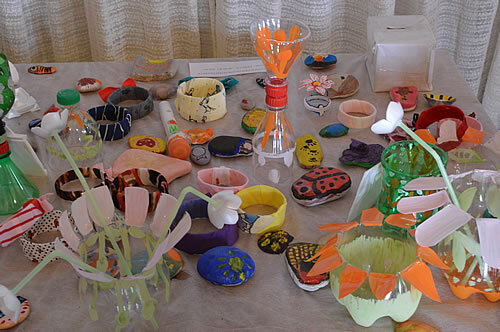 It’s good to see such a range of talent here, some very imaginitive repurposing going on with very attractive results! 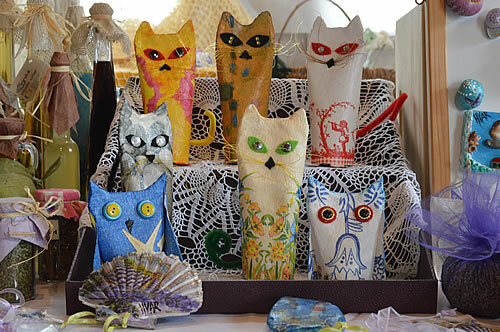 And look at the crochet as a setting for these cat doorstops – lovely! 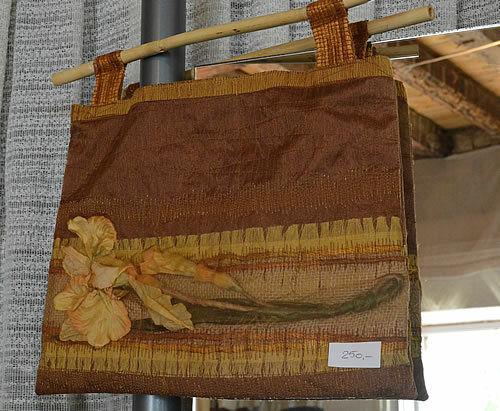 The beautifully crafted bags came in a range of lovely colours, very tempting! I was beginning to wonder where all these artisan products could normally be bought, a local gallery, perhaps? Hopefully this would not be my only opportunity! I was particularly taken with the Brač marble sculptures by the son of Baldo, the stonemason in Vrbanj. Nice to see the next generation producing such quality craftsmanship! 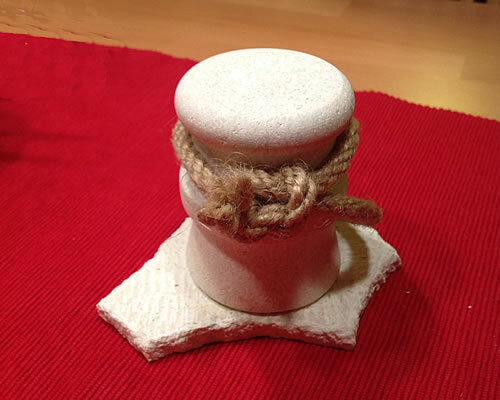 His small stone pillar, a perfect model of the ones that line the dockside for tying up boats is beautifully worked, so smooth and satisfying to the touch. Hmmm, I wonder if he might make me a larger version for our newly landscaped courtyard? 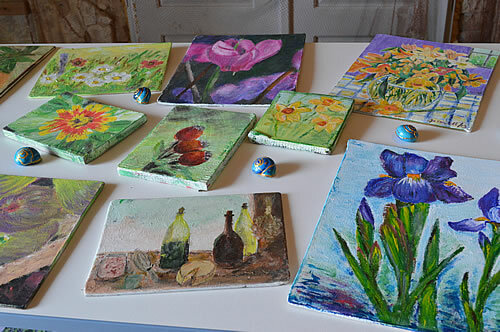 There was also a display of local kids’ art – they’re encouraged to repurpose familiar objects to make something creative. This is recycling at its best, and looks to be a lot of fun.